The project was a response to the ‘assisting caregivers find care for others’ prompt provided by Premera Blue Cross who also advised us through the project duration. 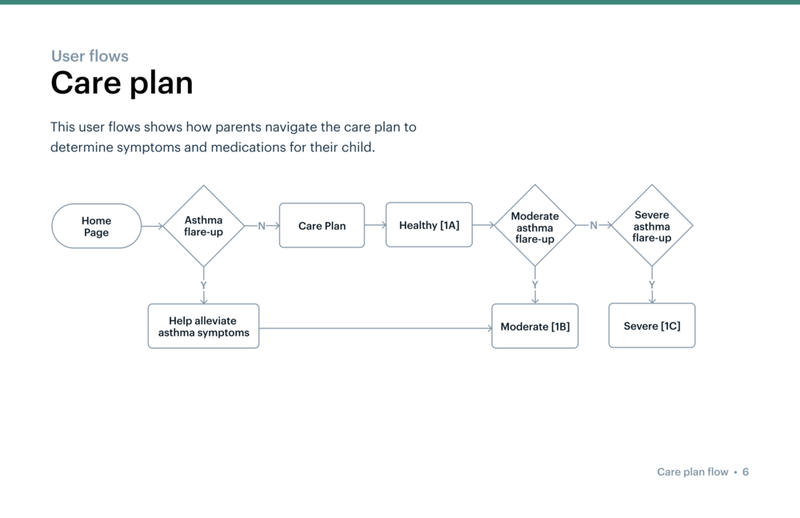 How might we help parents find and manage long-term asthma care for their child? Asthma is the most common chronic conditions among children in the United states. In Washington state, 11% of the children were diagnosed with Asthma and for 50% of them the asthma was ‘weakly controlled’. In 2010, Asthma related emergency costs were 73 million USD. Osler focuses on reducing asthma-related emergency care visits among children by helping parents better manage their child’s asthma. 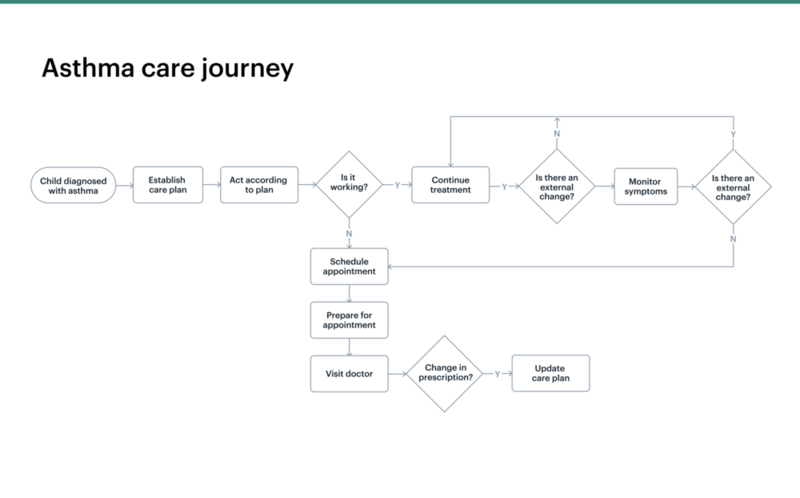 We designed Osler to achieve 3 things - provide accurate and actionable information, schedule and manage appointments and inform about triggers in the area. Powered by electronic health records, Osler provides accurate, actionable and relevant information when the parents need it the most. Seamlessly schedule and manage all asthma related appointments through the app. Location-based trigger monitoring keeps parents ready to deal with flare ups providing information on how they can be prevented. Children with special healthcare needs (CSHCN) are estimated to comprise 13% of the pediatric population and account for 70% of pediatric health-care expenditures. The most common condition being Asthma. As we started familiarizing ourselves with the challenges faced by caregivers, we quickly became interested in long-term pediatric care due to the untapped, rich problem space. Chronic conditions like Asthma affected a large population and contributed to significant expenditures. As we dived deeper, our interviews with parents and further pediatric research revealed understanding of and access to information as one of the biggest challenges they face. We developed a cultural probe to understand the parent child relationship as we hypothesized that this would be critical for finding the right care. We realized that kids were less likely to correctly express themselves around strangers and when undergoing symptoms. Motivated to address the different challenges faced by parents during their child’s care journey, we developed 90 ideas through a series of timed ideation exercises like 2x2, braiding, and crazy 8’s. Our ideas tried to address issues throughout the complete patient care journey. We categorized the ideas based on where they fell in the care journey process. Major categorical themes that we identified were easy appointment scheduling, finding relevant doctors, providing personalized information, diagnosis and treatment plan, and assisting decision making. To identify the ideas with the best potential we started with six thinking hats exercise which assisted in evaluating the ideas from multiple perspectives. A few ideas we also eliminated due to privacy and technical concerns. We then used Pugh’s decision matrix method to rank our better ideas against our desired outcomes - assist decision making, accommodate individual differences, improve access to information. A shared living document between parents, primary care provider and other medical professionals which accommodates values of parents and assists in decision making and keeps them in the loop. This idea takes parent preferences in mind while recommending pediatric care for the child. Preference may involve child rearing beliefs, preferred medical choices, and experiences of friends and family. 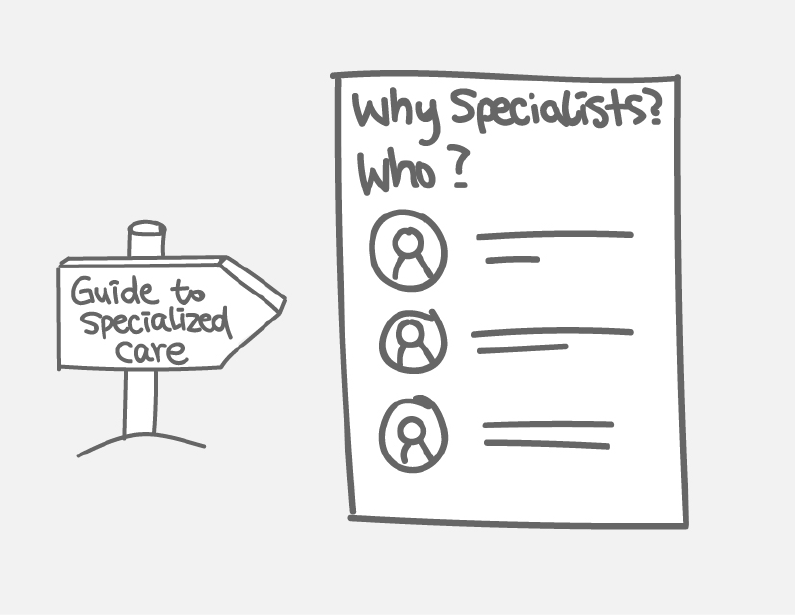 This idea provides assistance in making the right decisions when finding specialized care. It considers doctor availability, the urgency of care in addition to individual preferences. After selecting our 3 promising ideas and a discussion with the advisors, we realized that our scope was still too broad and decided to focus on a single chronic condition. Our assumption was that in developing a framework for long-term care for a chronic condition, we would be able to scale it to other conditions with minor tweaks. We identified long-term care approach across different conditions like asthma, diabetes shared similar patterns. Asthma became our central focus due to its scale among children. We went back to the drawing board and conducted additional primary research to understand the Asthma care journey. We conducted 2 semi-structured interviews and directed storytelling with participants having asthma since their childhood. Long consistent care was important for Asthma and their journey looked something like this. An asthma action plan is a written plan provided by the doctor when the child is diagnosed with Asthma. The goal of an asthma action plan is to reduce or prevent flare-ups and emergency department visits. It’s a pairing of symptoms to medications, as well as some test measurements like a child’s air flow. The asthma patients we spoke to said that they either never were given an action plan, or they never used one. Though, every medical association in the US recommends having an action plan, it has become a static document–probably living somewhere in a junk drawer with all of a family’s other documents. As we realized the key issues faced by asthma patients, we looked at existing solutions in the market to understand how they solve it. We saw that they were difficult to navigate, required extensive user input and lacked usefulness. 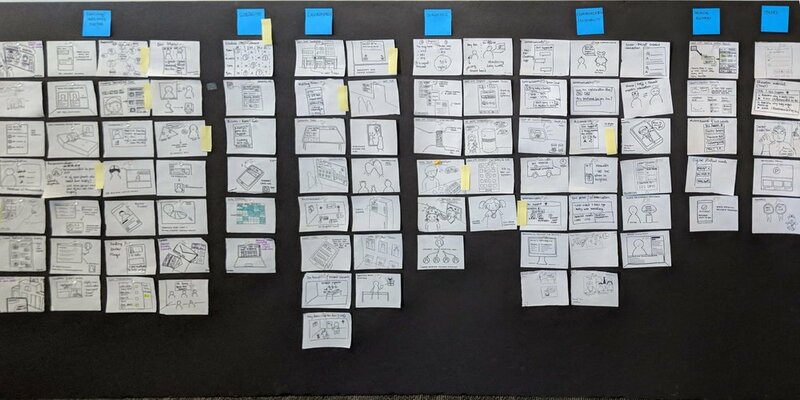 After developing the first set of wireframes, we quickly did a round of usability tests with participants to ensure that we are moving in the right direction. We iterated on our design with few more rounds of testing. We also mapped how our users would move in the app and the actions they could take. This aided us in developing the high fidelity prototypes. Osler design was focused on providing a positive and supportive feel to the user. We used illustrations and blue color through the app to showcase this. This approach to longterm care based on EHR and personalized to individual has the potential to be adapted to other diseases like diabetes. We had a really broad scope through almost half way through the process and we were struggling to get out of the pit of despair. Narrowing the scope down to a specific thing helped us focus and ultimately come up with Osler.